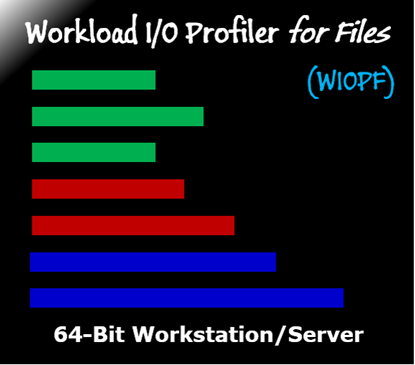 The hIOmon Workload I/O Profiler for Files (WIOPF) provides an "out-of-the-box" subscription-fee service for easily and quickly characterizing the specific "I/O profiles" of your particular applications, disks, and files. Moreover, it enables you to capture I/O operation performance metrics concurrently at two different levels within the operating system I/O stack: logical disk (for files) and physical disk. The WIOPF features a script for automated configuration of the hIOmon software. By default, this script configures I/O operation monitoring of the system drive logical disk (typically the C: drive) along with the associated operating system physical disk. You can also optionally specify other or additional logical disks (and their associated physical disk) to be monitored. The hIOmon WIOPF provides you with an extremely simple, quick, and easy tool to capture, display (both real-time and historical), and save a comprehensive set of automatically-summarized disk and file I/O operation performance metrics – including upon an individual application/process basis and in realtime. The hIOmon WIOP is a simple yet powerful I/O monitoring tool that can aptly handle a vast range of scenarios. Nonetheless, there can be those situations (e.g., a performance analysis restricted to a particular set of files) that require finer control over configuring the hIOmon software. The hIOmon WIOPF extends the many features of the hIOmon WIOP. The WIOPF extensions give you additional control over the configuration of the I/O monitoring capabilities offered by the hIOmon software. Like the hIOmon WIOP, the WIOPF provides an automated hIOmon software configuration option as noted above. This WIOPF option is the same as that provided by the WIOP. It can be selected during the WIOPF software installation process and also subsequently by using the hIOmon Disk I/O Ranger Display Settings "Reconfigure" option. Similarly, the WIOPF supports both real-time displays as well as historical displays. NOTE: All of the hIOmon WIOPF software packages, which are made available by electronic download only, are offered as a service upon a 30-day subscription fee usage basis at the prices shown. The subscription period starts upon the date of the hIOmon software installation, which must be within the month of purchase. Extended-use licenses for additional days can also be purchased separately. 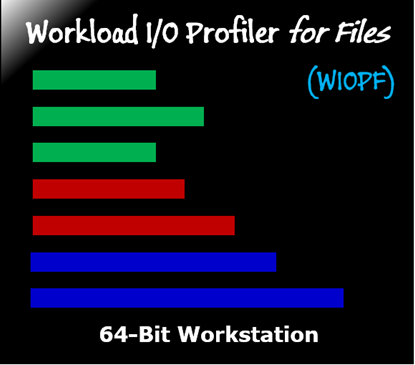 hIOmon WIOPF Workstation version for 64-bit operating systems only. The subscription period starts upon the date of the hIOmon software installation, which must be within the month of purchase. hIOmon WIOPF Workstation/Server version for 64-bit operating systems only.